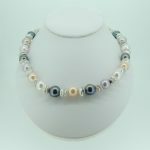 This multistrand white pearl necklace takes a fashion classic and turns it into something spectacular. Using two sizes of pearl (2mm and 7mm) strung on seven strands of silk, this necklace gives a new look to a white pearl necklace, with a lushness and texture that a simple strand cannot deliver. 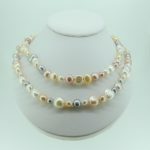 If you love pearls but are looking for something different, this necklace is for you and it would make an ideal gift for a special anniversary or for a bride on her wedding day. The rhodium plated silver hook clasp is lovely enough in its own right, giving a touch of sparkle to the necklace.